In the war against mosquitoes and the illnesses they carry, many weapons have been deployed, from DEET, bed nets, bacteria, to gene editing. Meanwhile, mosquitoes kill more than 400,000 people per year from malaria transmission alone on top of cases of dengue, chikungunya, Zika, West Nile virus, and others. But what if you could convince hungry female mosquitoes, who seek blood prior to laying their eggs, that they’re not as hungry as they think? A research team at the Rockefeller University explored this question with human diet drugs, which affect receptors in the brain related to hunger and satiety. Writing in the journal Cell, they describe how compounds in those diet drugs worked similarly on female mosquitoes—stopping them from seeking out human blood. 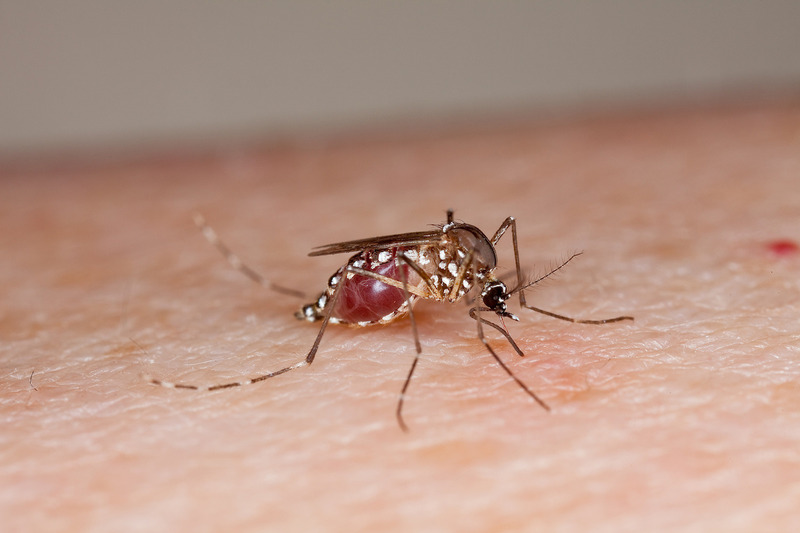 Rockefeller University professor Leslie Vosshall, a co-author on the research, joins John Dankosky to explain how these compounds work, and why altering or manipulating mosquito behavior may be an important component of any effort to reduce mosquito-borne illnesses and deaths. Read the new article on Aedes aegypti published in Cell. Find out how the Debug Fresno project in California is trying to control mosquito populations by producing and releasing millions of bacteria-infected male mosquitoes. How does mosquito repellant actually affect mosquitoes? Vosshall’s lab investigates. Leslie Vosshall is a professor of Neurobiology at The Rockefeller University and an investigator in the Howard Hughes Medical Institute based in New York, New York. JOHN DANKOSKY: This is Science Friday. I’m John Dankosky. Ira Flatow is away. Mosquito-borne illnesses infect tens of millions of people and kill more than a million people every year, whether it’s malaria, dengue, West Nile, or now Zika. And our war against the mosquito is a long and storied one. The repellent DEET turns 75 this year. And in the age of CRISPR, we’re even talking about editing these critters right out of existence. But one lab at the University of Rockefeller had another idea. What if we just could convince female mosquitoes– the problematic ones– that they’re just not hungry enough to bite us in the first place? What if we could put them on a diet? Here to talk about this more is Dr. Leslie Vosshall, Professor of Neurobiology at the Rockefeller University and a Howard Hughes Medical Institute investigator in New York, New York. Dr. Vosshall, welcome to Science Friday. Thanks for being here. LESLIE VOSSHALL: Thanks. I’m so excited. JOHN DANKOSKY: So why don’t you start by telling us how often female mosquitoes actually bite? ‘Cause it feels like the same mosquito comes back and bites me all the time. LESLIE VOSSHALL: So first of all, they love us. They love to fill up on your blood. And as soon as they’ve filled up and doubled their body weight, they actually will go into seclusion for four days. So the female that’s just bitten you, you won’t see her again for the next four days. JOHN DANKOSKY: OK. So they bite, and they go away for a while. Why are they so attracted us in the first place? You say they like feasting on our blood. Why? LESLIE VOSSHALL: They just love how we smell. So the mosquitoes that spread these diseases are– they have specialized on humans. So they’re super sensitive to our body odor. Every time we exhale, we excite them with our carbon dioxide in our breath. They love that we’re warm-blooded. But basically, these animals specialize on humans. And that’s why they’re so dangerous in spreading these diseases among humans. JOHN DANKOSKY: So you decided to see how they would react to human diet drugs. Explain why. LESLIE VOSSHALL: Well, we were really struck by this phenomenon that they will lose their appetite for four days after taking a blood meal. So our idea was, how can we get them to do that without feeding on blood? And so we know a little bit about how appetite works across the tree of life. And so one day, we thought, why don’t we just get some diet drugs and see if we can disrupt the appetite of mosquitoes? And that worked immediately. This was five years ago. And just over the course of a week, we were able to turn off mosquito attraction to humans just with a little dose of this drug. JOHN DANKOSKY: Wow. So it really worked very quickly. LESLIE VOSSHALL: It did. And then it took us five years to figure out how it was working and then how to get drugs that were specific just to insects and not people. JOHN DANKOSKY: So why drugs that are specific to insects and not people? If it works to give them human diet drugs, why not just feed them human diet drugs? LESLIE VOSSHALL: Well, I mean, I think people always worry if you have a bunch of mosquitoes flying around with drugs that are non-specific. It would just be a more elegant strategy to get drugs that really are just working really effectively on things like, let’s say, ticks and malaria mosquitoes and Zika mosquitoes. So we wanted to make it the most selective possible drug. JOHN DANKOSKY: And so how did you make this selection? How did you find something that worked specifically in the mosquito brain? LESLIE VOSSHALL: So this was a huge looking for a needle in a haystack exercise. So my postdoc, Laura Duvall, looked individually at 265,000 compounds. And of those, she found six that actually worked on the mosquito. And those drugs do not work on the human version of the same target. So five years later, we finally made it to the end of the journey. JOHN DANKOSKY: Hm. What do we know about how mosquitoes feel hunger? You say that when they have a blood meal, they go away for a couple days. Do we know anything about how they actually experience hunger? LESLIE VOSSHALL: So it’s this funny interplay between their need for protein. So they need blood to be able to get protein to produce eggs. And so we don’t exactly know what’s happening in their brains. But there’s something about taking in this huge protein meal that unleashes a huge series of physiological events that are poorly understood, where basically, the gut communicates to the brain that I am full. And so we think that our drugs hijack that conversation between the gut and the brain. And that’s why our drugs are turning off appetite. JOHN DANKOSKY: So you’ve got these drugs. They work. They’re turning off the appetite. Is the idea that this would eventually kill the mosquito, that they would die of hunger? Or are you just trying to deprive them of that one meal? How is this supposed to work? LESLIE VOSSHALL: So our drugs are not forever. So we don’t kill our appetite forever. So they last for two or three days. And then when the drugs wear off, they will go back and either come back to our traps and drink more of our drug, or they will find you and bite you. But where we think this is an innovative way to control disease vectors is that anytime you have a mosquito take two or three days off from biting, that’s some number of people who are not going to be bitten by infected mosquitoes. So these drugs are not going to kill mosquitoes. They’re not going to eradicate mosquitoes. They will just take a population that will take a break from biting people. JOHN DANKOSKY: You mentioned having them come back to get more of this stuff. How are you dispersing this? How would this work as a practical solution, getting this diet drug to mosquitoes? LESLIE VOSSHALL: That’s the really key question. So we need them to drink it. Just like when you take pills, you need to take it into your mouth, we need the mosquitoes to drink it. And so the plan is working off of the existing technology to lure mosquitoes to traps used every day to figure out what the epidemiology of infected mosquitoes is. And we lure them in. And then waiting for them there is a cup of our drug mixed into this elixir that they love to drink, which is basically salty water with ATP. And so they’ll land on the trap. They love the taste of that stuff. And they’ll take the drug. And then they will go away for two or three days and think that they’re full of blood. JOHN DANKOSKY: We’re talking about mosquito science here. And I know, Dr. Vosshall, that others have been looking at ways to just eradicate mosquitoes altogether, to edit them out of existence, or find ways to just get rid of the species. Why not just try that? Why don’t you try to get rid of mosquitoes altogether? What do you see as the consequence there? LESLIE VOSSHALL: So the whole mosquito community is working really hard on lots of ideas to deal with this very old and very complicated problem. And the eradication team is doing amazing work. I think that it will be difficult to eradicate all of the different species that are spreading diseases. Those approaches will have an impact. But I’m a believer in integrating multiple different approaches– so vaccines, chemotherapies, and repellents, and then our strategy of behavioral appetite control. So I always get a little bit worried about eradicating a species on Earth, because we do have a web of life. And I don’t know what will happen if we did succeed in killing all mosquitoes. I’d rather not do the experiments. JOHN DANKOSKY: Have you thought a lot about the unintended consequences of the work that you’re doing now, putting them on a diet and having them not feed the same way? What are the potential consequences there? LESLIE VOSSHALL: So we don’t know what the– it’s a good point. We don’t know what the potential consequences are. But again, we’re not killing them. It’s a temporary effect. So it may have some small, local effects on populations. But the main benefit is that there will be fewer female mosquitoes flying around and biting people. JOHN DANKOSKY: What are the things we need to be thinking about to really solve the mosquito disease problem, not just mosquitoes, but all the diseases they carry? I mean, what are the public health needs here in the United States and elsewhere around the world that we might need to avail ourselves of to help to solve this big problem? LESLIE VOSSHALL: And it is a huge, huge problem. As long as there’s been humans, there’s been mosquito spreading diseases to them. And so there’s a lot of areas. The Bill and Melinda Gates Foundation and the National Institutes of Health are putting huge amounts of money into making vaccines, improving repellents, bed nets, the GMO approach, our behavioral control. All of these different technologies need to be brought to bear, because we have not– the mosquito wins every time. The mosquito keeps winning. And so I don’t think that there’s any one approach that will put humans into a win. JOHN DANKOSKY: Earlier, I talked about DEET turning 75 this year. This is thought of as a repellent. What do we know about how these repellents actually work on mosquitoes? LESLIE VOSSHALL: What’s remarkable is that scientists cannot agree on how repellents work. So in your day-to-day experience, you know that Deep Woods OFF! works really well. So insect repellents work incredibly well. There’s still a lot of discussion in scientific circles about how they work. And the work from my lab and many others is trying to figure out, how does DEET work? And then once we know how it works, we could perhaps improve on it and come up with repellents that are longer-lasting and not as nasty to put on the skin. But believe it or not, it’s still a huge scientific controversy 75 years later. JOHN DANKOSKY: Well, so 75 years. We know that it works, but we don’t know exactly why it works. I can only imagine that if you were able to crack that code, you might be able to come up with a repellent that really, really works. LESLIE VOSSHALL: That is the dream, exactly. That is the dream. And science sometimes is tricky. This has been a long road to figure out how it works. And many labs are still working on it. JOHN DANKOSKY: So there’s repelling mosquitoes. We’re still trying to solve a 75-year-long mystery about that. There’s trying to eradicate them, something that, obviously, has its own unintended consequences, potentially. Are there other ideas about manipulating mosquito behavior other than what we’ve been talking about, trying to put them on a diet? How else might we manipulate the way they live and go feed? LESLIE VOSSHALL: The GMO approach can be used to kill mosquitoes. There’s also people thinking about GMO approaches just to change the behavior of the mosquitoes, like a science fiction cool idea. Could we make mosquitoes that lose interest in people and really specialize on animals? That would be another way of using modern CRISPR technology to change mosquito behavior. But again, these are such incredibly complicated public health problems, that anybody that has an idea that would be willing to try it out, I think we would be all ears. JOHN DANKOSKY: Some of the mosquito-borne illnesses we’re talking about that cause these gigantic public health problems like malaria, are they more difficult to prevent and manage than things like the flu? LESLIE VOSSHALL: Such a complicated question, I mean, because all of these diseases are so different. All of these different areas, people are trying to raise vaccines. An effective vaccine exists for yellow fever. And yellow fever is very rarely seen. So I think it depends on which critter you’re talking about. Malaria has been extremely difficult in every way to conquer, because it’s been very difficult to get a vaccine. But each of these diseases has its own unique problems. And flu is a problem. And all of the mosquito-borne diseases are a big problem. JOHN DANKOSKY: But we’ve gotten rid of malaria in the United States. It can be done. LESLIE VOSSHALL: It can be done. And that was a huge coordinated public health effort that only succeeded in 1960. A lot of people think that malaria is not relevant to the US. But through most of the 20th century, people in the southern US were being sickened by malaria. So it can be done. You need to invest heavily in public health infrastructure and many other infrastructure issues. But we are a high-resource country. So it’s much easier to pull off in a high-resource country. JOHN DANKOSKY: Well, thank you for keeping on this mosquito beat for us. Dr. Leslie Vosshall, Professor of Neurobiology at the Rockefeller University here in New York City. Thank you so much. LESLIE VOSSHALL: Thank you so much.